by marc / Wednesday, 03 April 2019 / Blog Category: Everything Vegas. Every summer the Fremont Street Experience offers free concerts from major recording artists. This year the theme is “One Louder.” While the name might invoke thoughts of hard rock music, the series this year has modern and hard rock along with pop and rap artists performing outside for free. Music fans of all ages can rock out under the iconic Viva Vision canopy during the free concert series which kicks off on Friday, May 24 with the American punk rock band, Good Charlotte. The series continues throughout the summer with full-length concert performances by some of music’s most sought popular acts from the past 20-30 years. Highlights this summer include Cheap Trick, Nelly, Sugar Ray, Buckcherry and more. 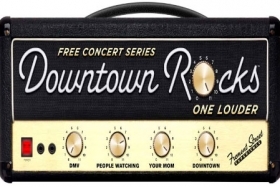 This year Downtown Rocks will have 10 free concerts on the various stages at the Fremont Street Experience. As you can see in the schedule above there are plenty of weekends where additional concerts could be added. Visit vegasexperience.com for the latest updates and which stage you’ll find each band. Personally, I’m looking forward to reliving my college years on July 20th with Fuel, Toadies, and Sponge. I still listen to the Toadies regularly and might enjoy Fuel and Sponge a bit too much when I hear either band on the radio while driving around Las Vegas. These concerts are general admission and free for anyone to attend. The Fremont Street Experience will be packed for every show. While it can be fun for most people it can become a little claustrophobic for some. If you’re in downtown Las Vegas and want to move from one casino to another without dealing with large crowds just dip north or south one block. Which free concert are you looking forward to this summer at the Fremont Street Experience?